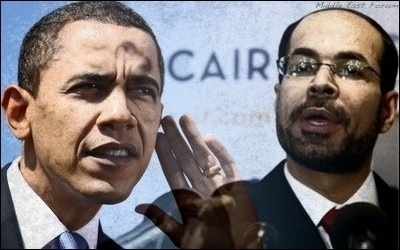 Obama's conceptualization of Muslims is much like that of the extremist Council on American-Islamic Relations (CAIR). As President Barack Obama's presidential motorcade turned towards the Baltimore Islamic Centre mosque, he could not have missed seeing three Muslim women holding signs protesting his visit. Standing just a few metres from the mosque were Indian-born American journalist Asra Nomani, Iranian-born human rights activist Nasrin Afzali from Montreal, and Nigerian-born convert to Islam Ify Okoye, who recently left the Islamic Society of Baltimore after giving up on the widespread misogyny she says is practiced at the centre. 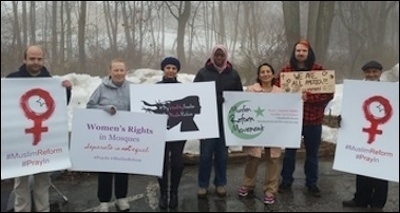 Their signs read "Women's Rights in Mosques" and "Separate is not Equal" to highlight the second-class status of women in that particular mosque. If Obama noticed the protesting women, he did not mention it in his speech. Chances are all three just did not fit the profile of what Obama and the Washington media considers a Muslim—women in tightly wrapped hijabs or bearded moustacheless men in long robes. President Obama is infatuated with orthodox ultra-conservative Islam. As far as Obama was concerned, his speech inside the mosque reflected his infatuation with orthodox ultra-conservative Islam that first came to light during his Cairo speech in 2009. Back then it was the Obama administration that insisted at least 10 members of the banned Islamist group Muslim Brotherhood not only be invited to attend his speech in Cairo, but that they sit in the front row. In his carefully crafted speech, Obama talked about American Muslims strictly in terms of religiosity. As if there were no Muslim trade unionists or astronauts in America, no dancers or designers. As far as Obama was concerned, only mosques, minarets and hijabs were relevant to U.S. Muslims. Moderate Muslims protesting outside the Islamic Society of Baltimore. Obama told his Muslim Brotherhood guests in Cairo: [T]here is a mosque in every state of our union, and over 1,200 mosques within our borders ... the U.S. government has gone to court to protect the right of women and girls to wear the hijab, and to punish those who would deny it." Fast-forward to 2016. It was as if he was rounding up his presidency exactly where he began—in the arms of the only Muslims he considers Muslim, the misogynist mosque establishment run by America's Islamists. There was no mention of the likes of novelist Khaled Hosseini or the self-funded female space traveller Anousheh Ansari let alone the three protesting women outside. [S]ince 9/11, but more recently, since the attacks in Paris and San Bernardino, you've seen too often people conflating the horrific acts of terrorism with the beliefs of an entire faith. And of course, recently, we've heard inexcusable political rhetoric against Muslim Americans that has no place in our country. Sabah Muktar was the hijab-clad woman who gave the welcome address to the president who was then greeted by five-year old girls also in hijab, their parents wrapping them up in attire that is both political and a symbol of sexuality. After the president and the press left, the hijabi women and girls in the mosque were herded back to the back of the bus, segregated, not to be seen or heard. We are not under attack by the West. We are in a crisis because of the unchecked intrusions of Saudi Arabia's extremist doctrine into the West, called Wahhabi or Salafi jihadi. We need to respond with Muslim reform that advocates peace, human rights and secular governance. Imagine if it was Asra Nomani who had Obama's ears rather than the hijab-clad women perpetuating their self-inflicted addiction to victimhood. Just imagine.